Auckland mayor Phil Goff reaffirms his desire to see Ports of Auckland moved from the CBD – but not if it means a shift to Northland. Ports of Auckland’s chief says Winston Peters’ plans to shift the business to Northland would cause a massive carbon emission spike, indicating nearly 300,000 motor vehicles now imported annually would have to be trucked south where most are sold. Tony Gibson said that the NZ First leader’s plan announced today would have a negative environmental impact. The port’s annual report out today showed 297,383 car and light commercial vehicles arrived at the port in the June 30 year, up 19 per cent. That means 5718 vehicles a week in the June year, or 814/day. Gibson said transporting cars from Northport near Marsden Pt would see carbon emissions spiral. 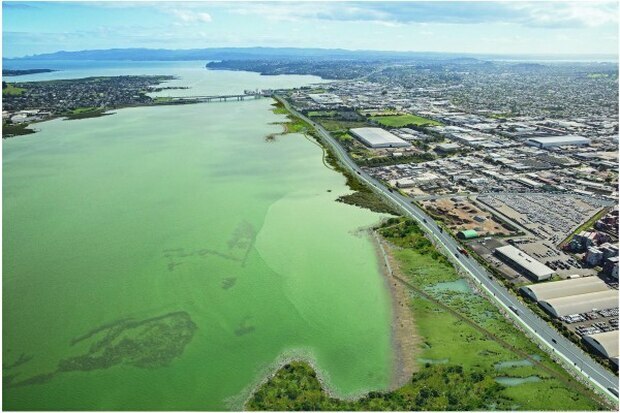 “If cars went to Northport, there will be 21,500 more tonnes of carbon emissions which is more than our total carbon emissions now at the Ports of Auckland,” Gibson said, citing an environmental study and the port’s big drive to cut its carbon emissions. “What do you think happens to the cars when they arrive at Northport? They would have to be put on trucks to go to Auckland,” Gibson said. He was reacting to Peters’ “cast-iron commitment” to move container operations from the port if his party was in a position of influence after the election. Peters wants the port moved by 2027, opening up 77ha of prime waterfront land for public use and the development of a new cruise ship terminal. Peters has long campaigned for a rail link to Northport – vehicles might not be moved on road but rail. His plan would stop vehicle deliveries by the end of 2019 and free up Captain Cook Wharf ahead of the America’s Cup. Gibson also reiterated the port’s already-announced plans to build a parking building on Bledisloe Wharf, saying more details would be out around mid-October when a new study was released. “That will have all the details but it will be between 1500 and 2000 [carparks]. It will be about four to five levels,” Gibson said, having a relatively compact footprint to minimise land use. Transport has turned into a roads versus rail contest with key points of difference between the major parties at this election. National has returned to a familiar theme with a $10 billion plan to build 10 major highways around the country, while Labour and the Greens have latched onto modern trams in Auckland and long distance trains between Auckland, Hamilton and Tauranga. Also in the mix is NZ First, with a strong emphasis on upgrading heavy rail, including improved access to Northland and its port at Marsden Pt, trains to Auckland Airport and re-opening the Napier to Gisborne line. The most visible battleground is Auckland, where congestion is choking the city at a cost of $2b a year and people are flocking to trains, buses and ferries to travel to work. Transport, and the crucial role it plays in housing and growth, is on everyone’s mind – and don’t politicians know it. National’s record in office dealing with Auckland transport is mixed, from rubbishing the City Rail Link to embracing it, the crazy decision to upgrade the Northwestern Motorway without a busway and completing the $1.4b Waterview tunnel – a huge pre-election success story. In fact, National is using figures showing the tunnel has halved travel times from the city to the airport to stick with cars and buses to the airport in the foreseeable future, while other parties argue over trains or modern trams along the route. Jacinda Ardern’s first public appearance as Labour leader was to announce the party would spend $3b to build tram lines from the Auckland CBD to the airport and West Auckland within 10 years, and complete the first leg of the airport route to Mt Roskill by 2021. This would be followed by light rail to the North Shore in the second decade. The Greens have gone one step further and promised to build the full 21km tram route from the CBD to the airport by 2021. They are also promising light rail from the Wellington railway station to Newtown by 2025 and Kilbirnie and the airport by 2027, and a wholly electric bus fleet for the capital city. Labour and the Greens would allow Auckland Council to introduce a regional petrol tax – possibly 10 cents a litre to raise $100m a year – to hop on board a more ambitious public transport programme for the city. The two parties have adopted the tram policy from lobby group Greater Auckland, which has also persuaded them to adopt the first stage of its ‘Regional Rapid Rail’ policy for a $20m trial train service between Auckland, Hamilton and Tauranga. If it’s a success, Labour and the Greens will invest in stages two and three of Rapid Regional Rail, delivering trains that can travel at 160km/h, new rail lines to Rotorua and Cambridge, and a tunnel through the Bombay Hills to reduce travel times from Auckland to Hamilton to 70 minutes. Labour’s decision to adopt Greater Auckland’s agenda is blatant pitch into Green territory, but it doesn’t bother Greens transport spokeswoman Julie Anne Genter, who believes voters know who is more committed to implementing the policies, and will vote Green to be sure Labour follows through. The Greens have also made a pitch for the youth and student vote by promising these groups free public transport costing $70m to $80m a year, which they say is less than 1km of new highways being built by National. Not everyone is on board Greater Auckland’s agenda, and debate still rages within transport circles over trams versus trains to the airport. NZ First’s plan is for a 7.5km rail line from Puhinui to provide a 30-minute journey by train from central Auckland to the airport terminal – part of its “Railways of National Importance” programme. NZ First wants to reopen the Napier to Gisborne rail line. 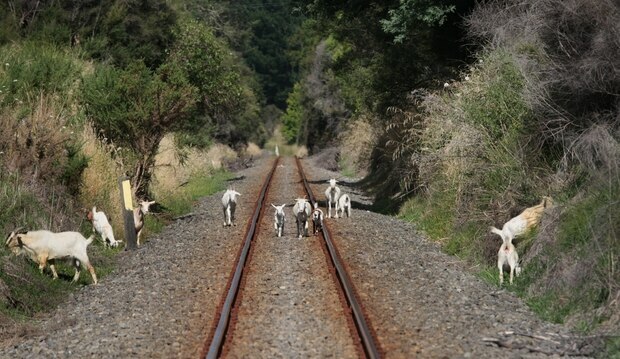 The party’s transport spokesman, Denis O’Rourke, says NZ First is not afraid to intervene and invest heavily in rail. The party has 13 immediate investment priorities, including upgrading rail in Northland to allow containers and cars to be moved from Northport to an inland port at Kumeu, and extending commuter rail to Kumeu and Huapai in West Auckland. The Maori Party has proposed a new “IwiRail” network for freight, tourism and regional employment. The party believes the project has the capacity to add $1b into the regions and will be asking their potential coalition partner to invest $350m. The plan involves connecting Gisborne to the East Coast Main Trunk Line in Kawerau and bringing back the mothballed Napier to Gisborne rail line to create 1250 jobs on the East Coast. National’s focus is unashamedly on roads while recognising rail has a role to play. It is centred on extending its “Road of National Significance” – begun in 2009 and largely complete – into a new set of major roading projects. Motorists would get a four-lane highway from Auckland to Whangarei, the $1.8b east-west link through Auckland’s industrial belt and other highway projects throughout the country. 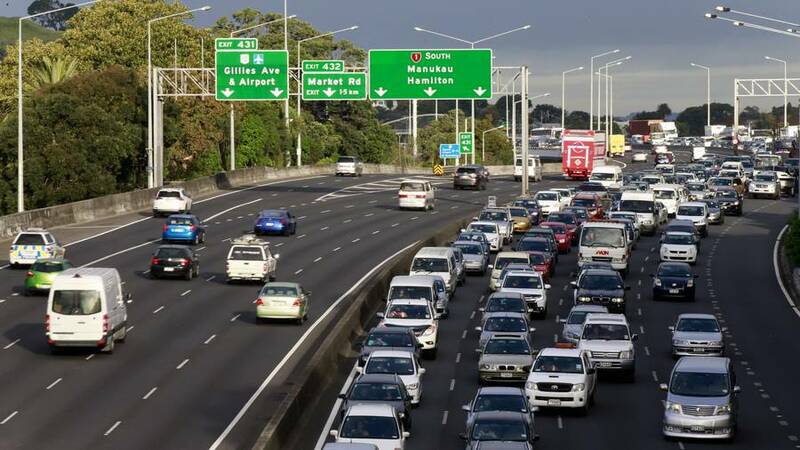 National has also come up with a $2.6b election transport package for Auckland that includes building a new highway alongside the Southern Motorway costing $955m and $615m for the Ameti transport project in southeast Auckland. That’s not to say, National is all about roads and Labour and the Greens are all about public transport and long distance trains. National has spent $1.7b electrifying rail in Auckland, it is paying half the cost of the $3.4b city rail link, committed $267m to rail over the next three years, a third rail track on the busy southern line between Westfield and Wiri, and $835m for a Northwestern Busway. Labour has announced it will increase regional transport roading projects from $140m to $280m a year, and will proceed with the east-west link in Auckland, albeit a scaled back version of National’s $1.8b scheme. One area all the main parties agree on is the need to improve cycling and walking in our cities, with National keen to build on a $333m urban cycleway programme and Labour promising to pay for the $30m SkyPath cycle and walkway over the Auckland Harbour Bridge. A strong focus on roads by extending its “Roads of National Significance” to 10 new projects costing $10b, including a four-lane highway from Wellsford to Whangarei and the $1.8b east-west link through Auckland’s industrial belt. A $2.6b package for Auckland, including a new highway from Manukau to Drury, $615m for the Ameti transport project in southeast Auckland and a $835m Northwestern busway. National favours cars and buses to the airport in the foreseeable future. A $267m rail package includes $130m to electrify rail from Papakura to Pukekohe and $37m for Wellington, including double tracking the Hutt Valley line between Upper Hutt and Trentham. A target of one in three electric or electric hybrid cars in the Government’s fleet of 15,500 cars by 2021. Adopted the policy of lobby group Greater Auckland for a congestion free network in Auckland. 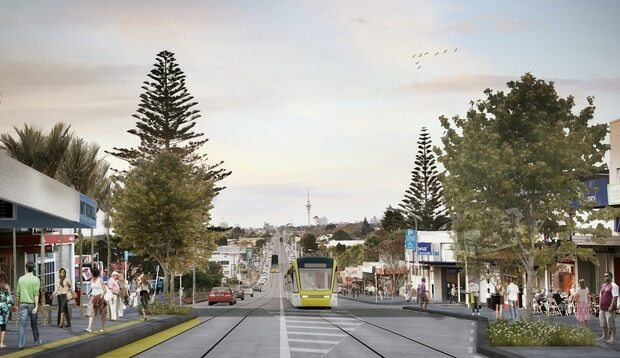 The main focus is $3b to light rail for trams from the Auckland CBD to the airport and West Auckland within 10 years, and complete the first leg of the airport route to Mt Roskill by 2021. Allow Auckland Council to introduce a regional petrol tax – possibly 10 cents a litre to raise $100m a year. Adopted the Greater Auckland policy for Regional Rapid Rail, starting with a $20m trial train service between Auckland, Hamilton and Tauranga. If successful, invest in stages two and three of Rapid Regional Rail with trains that can travel at 160km/h, new rail lines to Rotorua and Cambridge, and a tunnel through the Bombay Hills to reduce travel times from Auckland to Hamilton to 70 minutes. Fund the $30m SkyPath cycle and walking path over the Auckland Harbour Bridge. Free public transport for students and anyone under the age of 19. Like Labour, adopt the policy of lobby group Greater Auckland for a congestion free network in Auckland, but put it on a faster track. Build light rail for trams from the Auckland CBD to the airport by 2021, and light rail from Wellington railway station to the airport by 2027. Light rail towards Helensville and dedicated rapid busways to Howick and Botany. A new track on the southern line to speed up commuter and freight trains. Adopt the Greater Auckland policy for Regional Rapid Rail, starting with a $20m trial train service between Auckland, Hamilton and Tauranga. Emphasis on rail on “Railways of National Importance” and potential for modern tram routes in Auckland over the long term. Wants to upgrade Northland rail, including a line from Oakleigh to Northport; reopening the Napier to Gisborne rail line and progressive electrification of the main trunk line for improved freight and passenger trains with extensions to Dunedin and Tauranga. Build a commuter rail link between Swanson, Kumeu and Huapai; heavy rail to Auckland Airport. 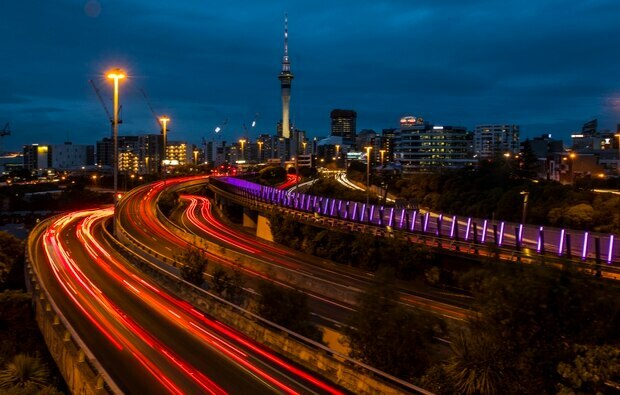 Toll state highways in Auckland. Opposed to a regional petrol tax. Investigate Northport taking some of Ports of Auckland business at Marsden Pt from an upgraded freight rail link to an inland port at Kumeu. A new “IwiRail” network for freight, tourism and regional employment with the capacity to add $1b into the regions. Ask a potential coalition partner to invest $350m. Connect Gisborne to the East Coast Main Trunk Line in Kawerau and bring back the mothballed Napier to Gisborne rail line to create 1250 jobs on the East Coast. IwiRail would receive $100m a year for regional line upgrades and maintenance. Increase the use of funding options to better reflect the principle of users pay, such as tolls on new and existing roads, congestion charges, peak time charges and preferential lanes. Revenue from tolls should be offset by cuts in petrol taxes. Technology and entrepreneurship should be encouraged in transport, including ride-sharing, car-sharing, congestion charging and high occupancy toll lanes. Encourage private sector investments in roads. Review regulation to ensure the viability of autonomous vehicles. Transport is very simple, says deputy leader Jeff Simmons, “politicians should get their grubby hands off it” and leave it to New Zealand Transport Agency to decide on a cost-benefit basis taking into account carbon emissions and accidents. While the global shipping industry has seen massive consolidation, the ships are getting larger. Anti-cartel legislation has removed international shipping liners previous exemption from New Zealand’s commerce watchdog. But a last minute change the the amendment to the Commerce Act granted them left wiggle room for international shipping companies to continue cutting costs by sharing vessels. Shipping companies are still able to exchange, sell, hire or lease space on international liners under the law, according to counsel at Chapman Tripp law firm. New legislation gives exporters the right to complain to the commerce commission if shipping liners are engaging in anti-competitive behavior. The New Zealand Shippers’ Council chairman Michael Knowles estimated four to five shipping companies would operate one service and share spaces on each other’s ships. He welcomed the legislation, having lobbied for the exception, and said the previous regulation was “toothless” and allowed shipping companies to fix prices, collude, and engage in anti-competitive behaviour. Knowles said the number of international lines has shrunk from about 20 to 12 over the past four years, with another possible two liners being “taken down” in the near future. He said it was because the shipping companies had been losing a lot of money and they needed to control capacity. Commercial appliance exporter Guy Stewart said there was “limited choice” when it came to shipping across the Tasman, but with shipping to Singapore and China there was more choice. Stewart is the managing director of export company Skope Industries. “Most ships will come to New Zealand full and return empty,” Stewart said. The coordination of shipping companies minimises the amount of empty space on ships coming in and out of New Zealand harbours, ultimately saving companies money on the cost of transport and piracy-prevention measures. In 2016, Ocean’s Beyond Piracy estimated the global cost of piracy was about $1.7 billion. The shipping industry bore roughly 80 percent of those costs, the group’s analysis showed. Over the last six months there have been 87 armed piracy attacks on ships worldwide, with instances highest in Singaporean waters. Piracy has been steadily shrinking as more money and resources have gone towards combating it, though the cost to mitigate risk remains high. While the $500 billion global shipping industry is seeing a massive consolidation, the mammoth container ships transporting $7 trillion dollars of goods around the globe are getting larger. Asia’s largest container line, Chinese company Cosco Shippings Holdings has said it would pay over $6 billion for its largest national rival, a company famous for owning the world’s largest vessel, a carrier more than twice as long as Auckland’s Sky Tower. Official figures show export numbers in New Zealand have steadily declined from 13,305 in 2012 to 11,898 at the end of 2106, a decrease of 11 percent. Though certain industries are optimistic as their products gain value. A Ministry for Primary Industries report expects export prices to continue to improve due to growing demand in the seafood sector. Seafood New Zealand predicts exports will hit a record $2 billion annually by 2020. Knowles said rates for New Zealand exporters were “probably at an all time low” which he said was a prolonged product of the global financial crisis when global trade “collapsed”. Knowles said the last minute changes had been “critical” for members. Road Transport Forum Chief Executive Ken Shirley has welcomed the National Party’s announcement of a new round of roads of national significance. “The road transport industry looks forward to the certainty of other political parties committing to these projects also, they are far too important to be treated as political footballs,” says Shirley. RTF is joining with a number of other transport organisations including the AA, the Chartered Institute of Logistics and Transport, New Zealand Shipping Federation and Bus and Coach Association to host the Election 2017 Transport Summit at Te Papa tomorrow. This is a great chance to hear directly from the political parties on their transport policies and quiz them on issues important to the broader transport sector. Information and tickets are available at www.transportsummit.org.nz. About 10 days ago, a cargo ship caught in rough swells off the Brazilian coast lost 45 shipping containers. Video on social media shows fishermen in small boats scavenging for whatever they could find from the containers, some of which apparently burst when they hit the water, according to a BBC report. Among the loot: air-conditioning units, bicycles, clothing and hospital equipment. Such incidents, while relatively rare, do happen now and then. Nearly two years ago, in October 2015, all 33 crew members, along with 391 containers and some trucks and trailers, were lost when the El Faro met Hurricane Joaquin in the Bermuda Triangle. Two months later, a ship en route from Oakland, Calif., to Seattle lost a dozen 40-foot containers just outside of the Golden Gate Bridge. Most were empty, but some carried Styrofoam insulation and plastic crates that rolled up onto beaches, according to www.sfgate.com. When millions of Lego pieces lost in a 1997 container-ship incident began washing up on English beaches, the conventional wisdom was that about 10,000 containers a year fall overboard , a figure often cited in reports about such losses over the years. As container ships continue to grow in size – the Port of Virginia is about to welcome its first vessel able to carry 14,000 containers measured in standard, 20-foot units – it’s hard not to think about the unthinkable. Six years ago, the World Shipping Council, a Washington-based trade group whose members account for about 80 percent of global ocean-carrier capacity, got on the case. Beginning with a survey in 2011, the group asked its members – which include major carriers such as Maersk Line, Mediterranean Shipping Co. and CMA CGM – to report the number of containers lost overboard for the preceding three years. It found that over the total nine-year period covered in its surveys, from 2008 through 2016, an average of 568 containers were lost at sea each year. That figure, however, doesn’t include catastrophic events, which the council defines as those that claim 50 or more containers. Factor them in, and the average rises to 1,582 a year. Nearly two-thirds of the containers lost in that time period were linked to catastrophic accidents, the council states. Among them: the complete loss of the MOL Comfort in 2013 in the Indian Ocean, with 4,293 containers, the worst container-ship loss to date; and the grounding of the M/V Rena off New Zealand, when roughly 900 containers were lost. 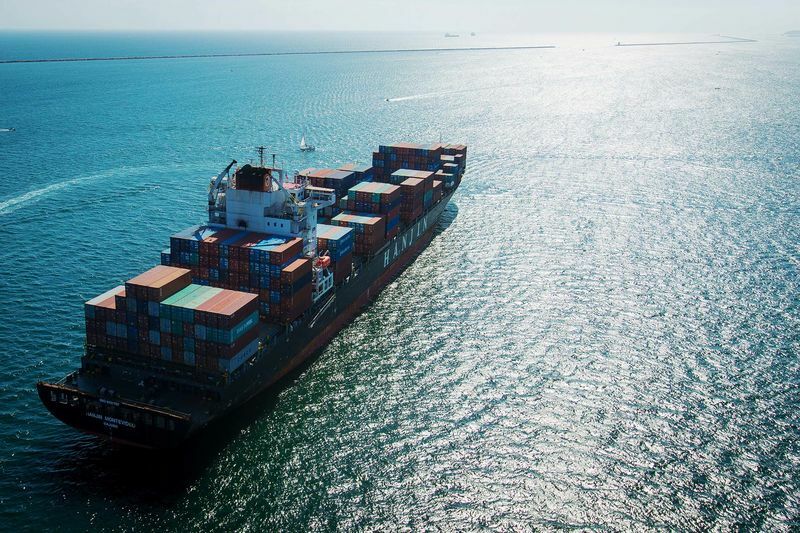 Last year, ocean carriers moved about 130 million containers packed with cargo, with an estimated value of more than $4 trillion, the council noted, and containers lost overboard represent about one-thousandth of 1 percent of that total. Maersk Line, the biggest ocean carrier in the world, moved 13.2 million full containers last year, of which 23 were lost overboard, Katherine Mosquera, a spokeswoman, said in an email. Kaltenstein said that while he applauds the industry’s efforts to better account for container losses, he has some questions. Ideally, the statistics provided would offer a fuller picture of what’s going on and where, he said: “What we’re seeing is really composite data,” with no information about the date and location of the losses, the number of containers lost per incident or their contents, or which company was involved, among other things. Kaltenstein also noted that the World Shipping Council had to extrapolate from its members’ data to get an estimate of the losses from the 20 percent of ocean-carrier capacity the group doesn’t represent, some of which may be operated by carriers that don’t have the same standards as the council’s membership. Even if its average figure of more than 1,500 containers lost per year is on target, he noted, over the course of a decade that’s still 15,000 containers. In late February 2004, the Med Taipei, en route to the Port of Los Angeles, lost 24 containers – 15 of them in the Monterey Bay National Marine Sanctuary south of San Francisco. In June 2004, scientists with the Monterey Bay Aquarium Research Institute found one of them – holding 1,159 steel-belted car tires – resting upside down on the seafloor, at a depth of about 4,200 feet. Using proceeds from a resulting legal settlement, the marine sanctuary has turned the container into a kind of science experiment, monitoring the impact site to track decomposition rates along with “potential impacts over time of steel containers and contents, as well as the recovery rates of natural habitats in the deep seafloor,” according to the sanctuary’s website. He questions the accuracy of the often-quoted figure of 10,000 containers lost a year, but he also wonders whether surveying companies that have an interest in showing lower numbers is the best way of getting to the truth. “I don’t know that anybody knows what the true number is, but I’m glad that people are working on firming that up,” DeVogelaere said. Michael McDaniel is a maritime attorney and principal of a Los Angeles-based law firm whose clients have been involved in such disasters as the El Faro, the MOL Comfort and the M/V Rena. One of the questions commonly raised at his firm is how many lost-container incidents go unreported. Among other reasons, shipping companies want to avoid the regulatory entanglements to which they can lead, he said. “Some incidents just aren’t reported, you know, especially in some parts of the world,” he said. Curtis Ebbesmeyer is perhaps the granddaddy of those with a keen interest in lost-container incidents worldwide. He has tracked them for decades and oversees a global network of beachcombers. A Seattle-based oceanographer with 50 years of experience, he remembers when thousands of Nike athletic shoes began to wash up on Pacific Northwest beaches about 25 years ago. Typically, when container debris washes up on a beach, there’s no way to identify the source, he said. Ebbesmeyer takes credit for first throwing out the 10,000 figure decades ago and notes that the World Shipping Council survey results cover a period that began less than 10 years ago. If there were a way to track the data back to the 1980s and ’90s, he believes his estimate would stand up. In any case, the larger issue isn’t really the number of containers, he argues, so much as what’s in them and finding a way to hold accountable those responsible for lost goods that end up on shorelines worldwide. A single container can carry 5 million plastic shopping bags, which if lost at sea could itself become a catastrophe, Ebbesmeyer said. The hulking container ships that transport sneakers, bananas and Barbie dolls around the world keep getting bigger. So are the companies that own them. Hanjin’s Montevideo container ship near the Port of Long Beach in Sept. 2016. Asia’s largest container line, China’s Cosco Shipping Holdings Co., last month said it would pay more than $6 billion for rival Orient Overseas International Ltd., owner of the world’s biggest vessel — a carrier longer than the Empire State building. Denmark’s A.P. Moller-Maersk A/S is in the process of buying a German competitor and boasts its own fleet of mega ships, including one that can carry about 180 million iPads. “Container shipping is now a game only for big boys with deep pockets,” said Corrine Png, chief executive officer at Crucial Perspective, a Singapore-based transportation research firm. The rising market concentration will “give the liners greater pricing and bargaining power,” she predicts. Hanjin’s collapse, in August last year, upended the industry in much the same way that the bankruptcy of Lehman Brothers roiled the financial sector during the 2008 crisis. One of the world’s largest shipping firms at the time, Hanjin faced a cash crunch as supply outstripped demand in the industry, weakening pricing power and profits for carriers. It is now in the process of being liquidated after a South Korean court declared it bankrupt in February. The growing use of mammoth ships is key to the turnaround. Companies who own them are able to deploy fewer vessels and move more cargo on a single journey to benefit from higher rates, said Um. By her estimates, there are now about 58 of these huge carriers worldwide that can transport more than 18,000 containers, and the number is expected to double in two years. About half the new vessels will be added by the biggest firms. The excess supply that derailed growth last year hasn’t completely disappeared as new entrants expand and as older vessels still remain. Capacity in the container shipping industry is expected to grow 3.4 percent this year and 3.6 percent in 2018, according to Crucial Perspective. Still, recovery in demand seems to be on track. After posting losses in 2016, companies are seeing signs of business picking up. A.P. 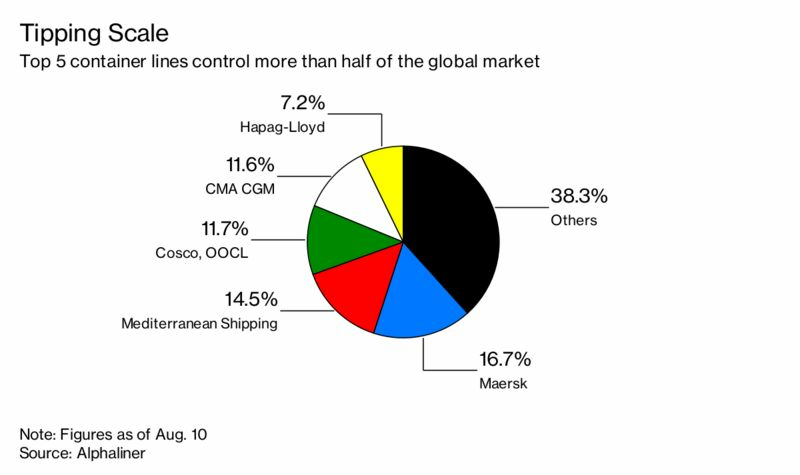 Moller-Maersk, which owns the world’s biggest container shipping business, said in May that it has seen strong demand toward the end of the first quarter. Cosco said earlier this month that as conditions improve it expects to report a first-half profit of about 1.85 billion yuan ($276 million), compared with a loss a year ago. “We forecast global demand growth to outpace supply growth in 2017-2019,” Hong Kong-based analyst Andrew Lee at Jefferies Group LLC said in a note last month. Earlier this year, Maersk, South Korea’s Hyundai Merchant Marine Co. and other shipping lines reached agreements with their customers to raise annual rates from May for cargo headed from Asia to U.S. stores like Wal-Mart and Target. Retailers in the U.S. usually increase inventory during the third quarter, ahead of the year-end holidays, and Lee said freight rates are expected to rise further as the peak season for the container shipping industry kicks off. In 2015, Cosco Group and China Shipping Group announced a merger to create Asia’s biggest container line, Cosco Shipping Holdings Co. In 2016, CMA CGM SA bought Singapore’s Neptune Orient Lines Ltd.; Maersk agreed to buy Hamburg Süd and Japan’s three shipping companies agreed to consolidate their container shipping businesses. In 2017, Hapag-Lloyd AG completed its acquisition of United Arab Shipping Co. and Cosco Shipping offered to buy Orient Overseas International of Hong Kong. It is now becoming clear that the appalling emissions from ships that cause global warming and local injuries can be virtually eliminated. A large ship emits the carbon dioxide of 75, 000 cars, NOx of two million cars and particulates of 2.5 million cars (DNVgl) plus large amounts of SOx, something little seen with cars. Now think what a combination of Flettner rotors, Airborne Wind Energy (AWE), sails with multi- mode energy harvesting, reinvented photovoltaics and wave power will do. Flettner rotors on ships – typically four huge columns – typically exploit the fact that an electrically rotated cylinder in a wind creates thrust. It has better tolerance of wind direction than sails. It could be complementary to AWE which creates electricity using tethered drones or cloth kites way above the ship at 200-1000 meters where winds are four times stronger and more continuous. Photovoltaics as solar road technology applied to large ships can also supply up to MW level particularly if increasingly affordable gallium arsenide is used. All three will be complemented by wave power lifting the ship to reduce drag, a technique that is newly viable. Each gain is multiplicative and the complementary intermittency could lead to a greatly reduced need for batteries and possibly the complete elimination of them. In 2016 Norsepower’s successful Flettner sea trials showed potential for 20% fuel savings of up to 20% on favourably windy routes. Viking Line plans on reducing ship fuel consumption by 15% or more. Norsepower and the world’s biggest shipping company, Maersk, to start testing Flettner in Maersk ships starting 2018. Aim is 7-10% of fuel cost leading up to 300000€ savings in big tankers. There should be similarly impressive percentage reduction in emissions. The world’s first conference on “Energy Independent Electric Vehicles” takes place 27-28 September at the Technical University of Delft in the Netherlands. Exclusively on the subject this IDTechEx event will embrace the commercial opportunity and technology roadmap including ship energy independence. Naval DC describes its many commercially successful large boats that are energy independent and where it is headed. Three organisations present their AWE at 30-100 kW with potential to provide multiple 1MW systems on ships – KiteNRG of Italy, Kitepower of the Netherlands and Kitemill of Norway. Solaroad TNO of the Netherlands presents solar roads suitable for ships that could produce hundreds of kilowatts potentially complementing solar sails that make electricity from sun, wind and rain developed by presenter the University of Bolton in the UK. All that could exceed the megawatts needed and make MWh batteries on ships a thing of the past. Toyota of Japan gives a keynote. Breakthroughs in enabling technologies such as the necessary electric motors and power electronics are also announced and explained. The event is staged by analyst IDTechEx which has the only comprehensive reports and consultancy on EIVs and enabling technologies such as structural electronics, triboelectric and 6D motion energy harvesting and extreme lightweighting including a report, Electric Boats and Ships 2017-2027. There are six optional Masterclasses on EIVs and their technologies on September 26 and 29 and a small exhibition and viewings. Partnering the event is TU Delft which has supported more record-breaking solar racers on land and water than anywhere on Earth and researches wind and solar power for vehicles, their power electronics, photovoltaics and dielectric elastomers making electricity from waves. Of all the mind-bending facts and figures about the expansion of the Panama Canal, the one that surprises me most is that this isn’t the first time it’s been attempted. Twenty-five years after the canal opened in 1914, work began on a second set of locks and approach channels to accommodate America’s larger warships. The project ran for several years before being cancelled after World War II. In 2007, Panama decided to have another crack at it. The plan was to build a new set of larger locks at both ends of the canal to create a third lane of traffic (the existing locks already allow simultaneous passage in both directions), thereby allowing bigger vessels to use this handy 77-kilometre shortcut between the Atlantic and the Pacific. The project was supposed to finish in 2014 to coincide with the canal’s 100th anniversary. However, disputes and delays meant it overran by almost two years. Finally, on June 26, 2016, the Cosco Shipping Panama container ship became the first vessel to use the new locks, paying the tidy sum of $US575,545 for the privilege. The canal has two visitor centres where you can learn more about this engineering marvel. Most people visit the one at the Miraflores Locks, 10 kilometres outside of Panama City, but I’d recommend taking the scenic Panama Canal Railway to Colon to visit the newer complex at the Atlantic end. The trip takes about an hour and offers tantalising glimpses of ships transiting the canal interspersed with shipyards and bird-filled wetlands from the train’s glass-domed observation car. Entrance to the Agua Clara visitor centre (named because the water is clearer on the Atlantic side) costs 15 balboas ($19) and includes a 12-minute video presentation plus access to an observation terrace. Whenever I watch one of these films I feel faint from the bewildering complexity of a project of this scale. The expansion involved a new 6.1-kilometre access channel at the Pacific end of the canal, deepening and widening both canal entrances and building two sets of locks with 16 lock gates weighing more than 3000 tonnes each. A guide shows me a video on his phone of one of the gates being manoeuvred into place by remote control – a painstaking process of inching it backwards and forwards on a bed of rollers – surely one of the most stressful parallel parks in history. All of which raises the question: why go to all this trouble when you already have a perfectly good shipping shortcut that’s been used by more than a million vessels? Because container ships are getting bigger and Panama is missing out on toll revenue. Even though the budget for the expansion ballooned way above the initial $US5.25billion estimate, the new larger locks can handle ships with almost 13,000 containers. Plus the third lane of traffic doubles the canal’s capacity to about 30,000 vessels a year. The toll paid is based on a ship’s weight, so that’s a compelling incentive to increase capacity. One of the highest tolls paid last year was a staggering $US829,468 by the MOL Benefactor which transited on July 1. Incidentally, the smallest on record was by Richard Halliburton who swam the length of the canal in 1928 for the princely sum of US36¢. The new locks are 60 per cent wider and 40 per cent longer than the old ones, which means they could accommodate the Empire State Building should someone decide to pop it on a barge and ship it to Peru. Although the new locks could comfortably house the world’s largest cruise ship (the 362-metre-long Harmony of the Seas), unfortunately there isn’t enough clearance under the Bridge of the Americas to allow it to pass through the canal. Even though the new locks are bigger, they use less water for each transit than the old ones thanks to three vast reservoirs which recycle 60 per cent of the water from each lock chamber. A large-scale reforestation project helped offset the emissions created during the expansion and the fact that more boats can now use the shortcut should mean less global CO₂ emissions from shipping. It takes a ship about three hours to pass through the three lock chambers, which, let’s face it, doesn’t sound like the world’s most riveting spectator sport. Yet, as I watch Shergar, a 225-metre LPG tanker, carefully make its way between the second and third chambers, I find the spectacle strangely captivating. From the observation deck I have a clear view of the length of the lock plus the gaggle of ships waiting patiently on either side. Unlike the old locks, where ships are pulled through by locomotives, the new ones use tugs and the ships’ own engines. Each chamber raises the ship by nine metres until it eventually reaches the canal, 27 metres above sea level. One oddity is that in certain places the canal isn’t wide enough for two Neopanamax ships (the classification of the vessels the new locks can accommodate) to pass each other. So the passage of these ships has to be carefully co-ordinated to avoid an embarrassing mid-canal stand-off (“You reverse. No, you reverse. But I’m bigger…”). The new locks can also handle traffic only in one direction so three Pacific-bound ships are allowed through each morning then the direction is reversed in the afternoon. I presumed the locks themselves would be off limits to visitors and protected by a ferocious curtain of security. However, at certain times of day you can drive over both the new and old lock gates and it’s worth hanging around to see them from this perspective. Although the decision to expand the canal was approved by about 80 per cent of the voters in a referendum in 2006, the constant delays and escalating costs quickly eroded public confidence. Originally opened in 1869, this 193-kilometre shortcut between the Mediterranean Sea and the Red Sea in Egypt is used by about 17,000 vessels a year as an alternative to the treacherous trip around the southern tip of Africa. Thousands of Russian Gulag prisoners died during the construction of this 227-kilometre canal. Its shallow depth, however, means less than 50 boats a day now use it to get between the White Sea and the Baltic Sea. Connecting the Baltic Sea with the North Sea, the 98-kilometre-long Kiel Canal passes through the German state of Schleswig-Holstein and saves ships a 1000-kilometre detour around Denmark’s Jutland peninsula. Originally started in the 1930s, this important maritime gateway has been extended several times and now links three rivers – the Rhine, Main and Danube – with the North Sea and the Black Sea. At almost 1800 kilometres, the Beijing-Hangzhou Grand Canal is the world’s longest man-made waterway. Work started on the project as far back as the 5th century BC and today the UNESCO World Heritage-listed canal connects Beijing with Hangzhou as well as linking the Yellow and Yangtze Rivers. Ten new roads for the country, costing an estimated $10.5 billion, have been announced today by the National Party. Prime Minister Bill English announced the new major routes during a visit to Hawke’s Bay. The new roading projects have been labelled the ‘next generation of Roads of National Significance’, adding to seven previous roads created in the project. National Party Transport Spokesperson Simon Bridges said, “The time has come for the next generation of nation-building projects so today we are announcing that 10 of the country’s most important routes will form the next generation of Roads of National Significance”. New Zealand Transport Minister Simon Bridges at a New Zealand Transport Agency event in Auckland. “The new roads are expected to cost around $10.5 billion, on top of the estimated $12 billion invested in the initial seven,” Mr Bridges said. “Like the first tranche, they will be funded from the National Land Transport Fund and the use of Public-Private Partnerships,” Mr Bridges said.